Many corn producers fertilize corn plants to maintain dark green color even late in the growing season. Producers therefore, may apply much more N than is really needed to obtain an economically optimum yield. Reliable tissue tests for detecting N status of corn plant can improve profitability and reduce the potential for nitrate contamination of water supplies. During the grain-filling period, if nitrogen levels are not adequate, corn plants remove nitrogen from the lower portion of their stalks. When corn plants are over fertilized, nitrate will accumulate in the lower portion of stalks without contributing to a greater yield. Measurement of nitrate concentration in the lower portion of corn stalks at the end of the growing season can be used to determine nitrogen deficiency, sufficiency, or excess in corn silage, grain corn, and sweet corn. The Cornstalk Nitrate Test (CSNT) can be used to gain confidence in the nutrient management planning process. It can be used to check availability of N from manure and from the pre-sidedress N test (PSNT). In years with a cool and/or wet spring, microbial activity responsible for mineralization is low. In this condition PSNT may indicate the need for N fertilizer when sufficient N may still be released from the manure and soil organic reserve when soil temperature gets warmer later. The end-of-season cornstalk nitrate test can confirm if fertilizer was needed and help farmer decide N application adjustment in future years. The test requires collection of corn stalks at end of season just before harvest. For grain corn, stalk samples should be taken between one and three weeks after black layer formation on 80% of kernels. Collect samples from 15 random plants for every 10 acres of field. Cut an 8 inch segment of stalk starting 6 inches above ground level. Remove leaf sheaths from the segments. 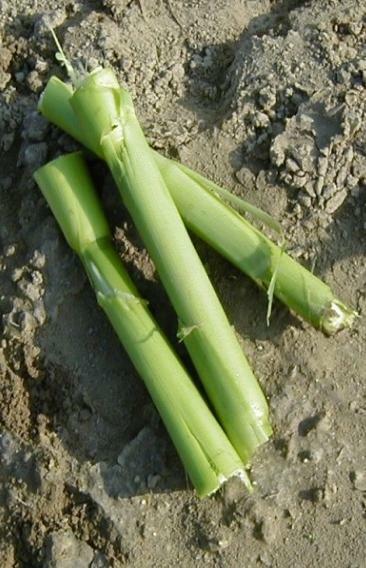 Stalks severely damaged by disease or insects should not be used. Areas with differing soil types, or management history should be sampled separately. Place segments in a paper bag (not plastic, this promotes fungal growth) and dry or freeze. Samples can be processed by the UMass Extension Soil and Plant Nutrient Testing Laboratory . If test shows nitrate concentration is low, it means corn plants could have benefited from higher N fertilizer application. When N concentration is more than 1700 ppm N, it indicates that corn plant had access to more N than it needed to produce maximum yield. In this situation it is recommended that the farmer lowers fertilizer and /or manure application rates by 5-10% and repeat the test in the next 2-3 seasons to reach the optimum level. Note: Measurement of nitrate concentration in the lower portion of corn stalks at the end of the growing season can be used to determine nitrogen deficiency, sufficiency, or excess in corn silage.